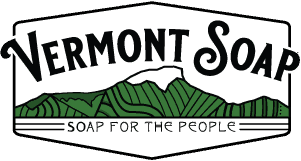 As the FIRST company in the US to offer organic private label services Vermont Soap likely has more cumulative experience in organic personal care than ALL of the other private label shops put together. Since 2003 we have helped hundreds of brands like yours to launch and expand their organic and/or strictly natural programs. If you need 500 pieces for a test launch or 75,000 pieces a month we are here for you. Whatever your brand’s requirements, talk to our highly trained and experienced private label experts to learn what Vermont Soap can do for you and for your company’s bottom line. Remember: Nobody understands organic soap and cosmetic bases like the people who invented them. There are over a dozen different bottles, screw top pots, lids and sprayers in stock at our factory in Middlebury, VT, USA. Use our component inventory or supply your own. All Vermont Soap products can be customized to your specifications and shipped in bulk containers to your factory or filler. You are responsible for your own labels. We help by giving you label die lines for your artist, recommending competent artists and printers that are familiar with these type of projects, and by providing free proof checking of your draft labels to help insure compliance with USDA, FDA, FTC and CPSC regulations. We are not legal experts but this is what we do every day. The service is free and it saves everyone a lot of stress and launch delays. Bottles can be bulk packed for free or put into labeled case packs by quote. We are familiar with Amazon personal care product packing and bagging requirements and will drop ship Amazon orders directly to their warehouses for you. Products are bottom coded with lot numbers and a best-use-by date. Let us know if you have specific coding requirements. Vermont Soap will completely handle the initial application and annual USDA audit of your product and the label it bears so you won’t have to worry or even think about organic certification. Cost is only $100 per year for each item or size certified organic through Vermont Soap. Our name is Vermont Soap and that is what we are famous for. Organic bars, liquids, hand and body wash gels, foamers, sprays and pastes can all available with or without USDA certification. Use our high quality US made twist up tubes or supply your own. Smooth, creamy and effective. Available with or without a USDA seal. We call the process of making salves, balms and butters Hot Fill. Containers are filled hot and flash cooled solid to a creamy finish and then labeled, coded and packed. Shampoos and other products are available in many sizes with your label. From pocket to industrial size they are scents-ably priced and good to the last spray. Click here to contact one of our private label specialists for more information and quotes. Please see our FAQ page for more information or contact one of our private label specialists.